But the real question shouldn’t be “Is it Irish?” but rather, “Why are we only eating this delicious meal once a year?” This year, I baked instead of boiled the beef for the first time and added a delectable brown sugar and mustard glaze. 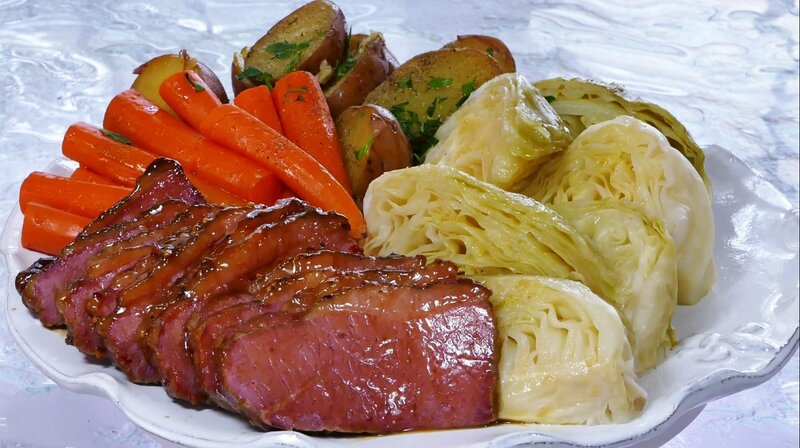 While there is a trade-off–boiling makes the corned beef tender while baking it adds more flavor–I am now sticking with the baked method. The flavor is just so much better! I remedied the toughness of the corned beef by cutting it in very, very thin slices. If you do that, you won’t even notice the toughness. I found a wonderfully simple glaze that I brushed over the corned beef about 2 hours into the cooking process, and continued every 15 minutes until it was done. I saved some glaze and spooned it over the sliced on the serving platter. Delightful! The more corned beef and cabbage we eat, the more Irish eyes will be smiling! Watch my HOW TO video here!